We all enjoy a good laugh now and then. 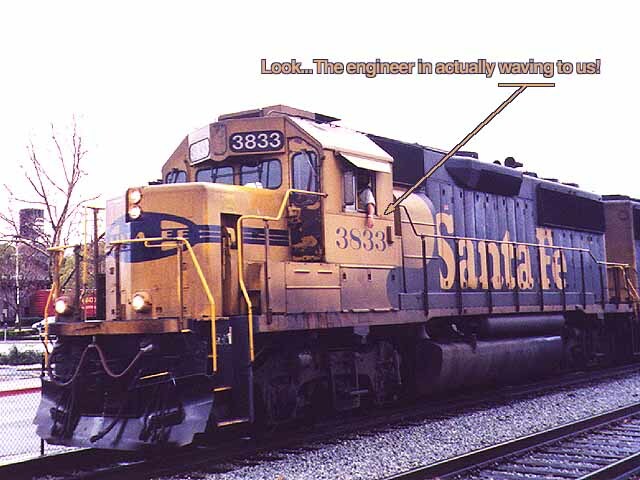 Unfortunately, we railfans often get so absorbed in counting rivets, comparing horsepower and memorizing road numbers that we forget we're in the hobby for the FUN. Sometimes it is easy to spot humor trackside. A photo presents itself and needs little or no explanation. Other times it is up to us to create the humor. Every photo on this web site has been processed in Adobe Photoshop. Most of the time we simply scan from prints, crop where we want, adjust the colors as necessary and post them. Other times -- usually when we're feeling bored or feisty -- we'll tinker with the images and add text, graphics or other elements that were otherwise not part of the original scene. Some of these creations can be found on the Postcards page. The less serious ones are here. 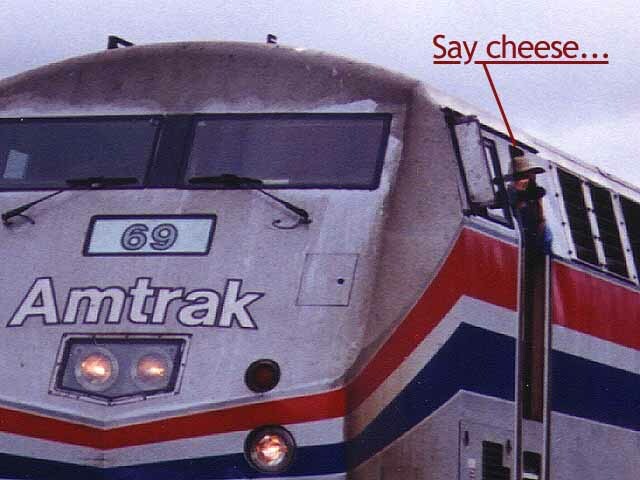 If you look closely, you will see the camera in the hand of this Amtrak crewmember. This shot of the California Zephyr was taken in Truckee during its 1998 Railroad Days festival. The shutterbug was undoubtedly getting his shots of the Union Pacific 4466 steam engine, which had been brought from Sacramento for the occasion. Photo by Roni Gehlke. 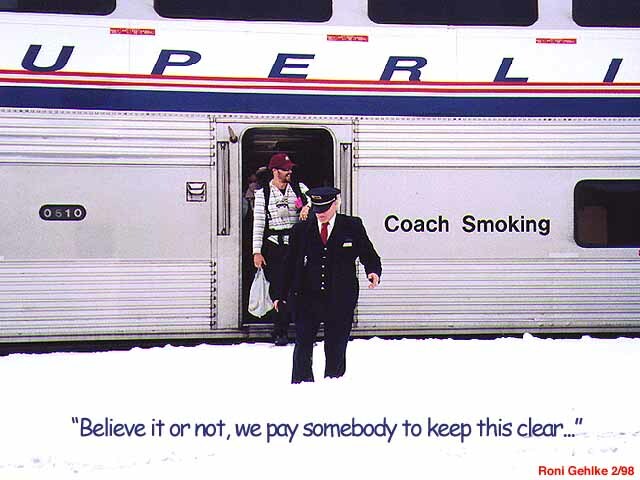 The snow in Truckee is so deep on this day in February 1998 that not even a conductor's step stool is enough to rise above it all. The befuddled conductor's quip appears at the bottom of this photo. Photo by Roni Gehlke. How windy was it this morning in Oakley? Very, if this tumbleweed impaled on the crossing arm at Big Break Road is any indication. 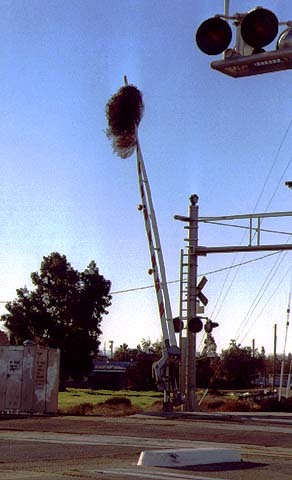 We captured this scene in January 1999, moments before a passing Amtrak caused the gate to lower and the offending weed to resume its tumbles. Photo by Roni Gehlke. 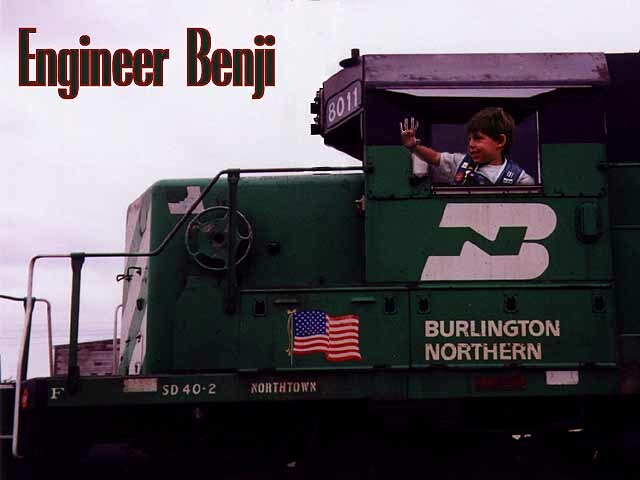 It's every young train fan's wildest dream to sit in the cab of a real locomotive. Our son Benjamin gets his wish in this composite photo. Illustration by Glenn Gehlke. No, Nickelodeon hasn't bought out BNSF. But you can bet there would be some wild paint schemes wandering the rails if they did! 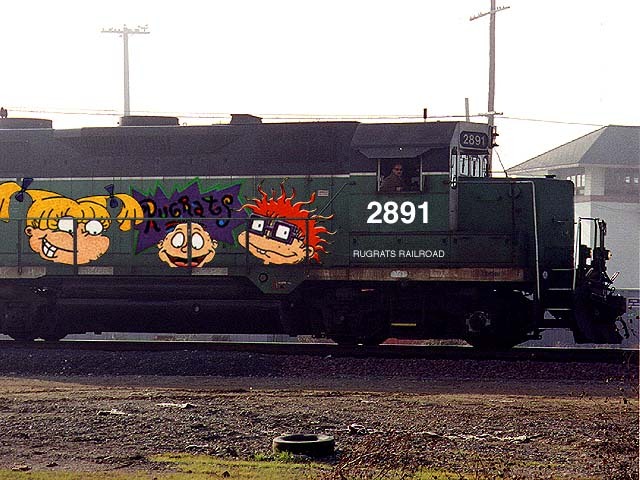 I created this "Rugrats Railroad" locomotive for Benji. Illustration by Glenn Gehlke. A friendly wave from a passing train isn't that uncommon, but we don't catch it on film that often so we poked a little fun. Photo by Roni Gehlke. This page was last updated Monday, April 19, 1999 at 00:05 hrs.